“My own son Bobby was born sleeping at 22 weeks. He is why UBW exists, as at the time back in 2009, things were very very different regarding the after-care of losing your child. “Bobby was alive when I arrived at the hospital, and I did not expect him to die that day. Therefore, I was unprepared and had nothing, not even for myself for our stay. “It was due to a partner of a member of the hospital staff that he was dressed and wrapped. She had made him and the many others like him a handmade sewn tabard with a fleece blanket. Both were simple but appreciated. This is the story of Lucy Willis, the founder of Upon Butterfly Wings. It is also the story of what drove her to begin this charity. Losing a child is a true tragedy, and it is many parents’ worst nightmare. While nothing can make up for the tragic loss of life, we can help bereaved parents by reaching out to them. As knitters, we can do this through our charity knitting. And Upon Butterfly Wings can help us to do this. 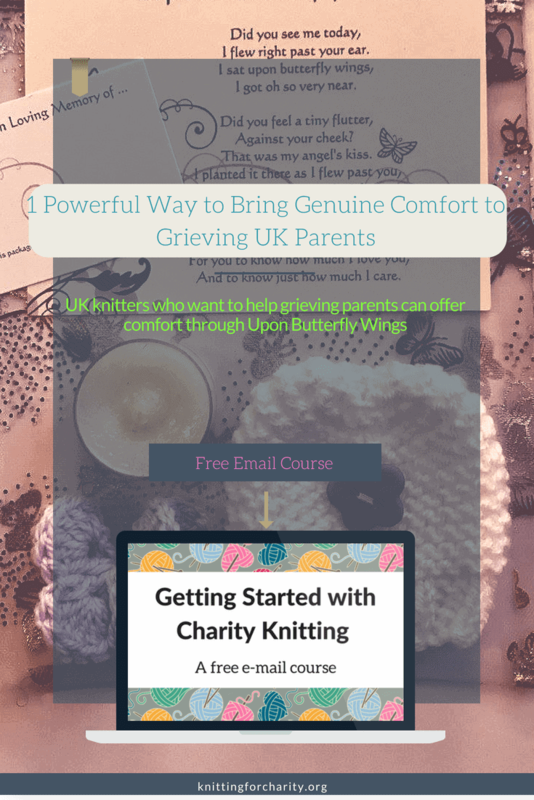 Upon Butterfly Wings (or UPW) is based in Crawley, West Sussex in the United Kingdom. They gather donations from dedicated knitters and crocheters. 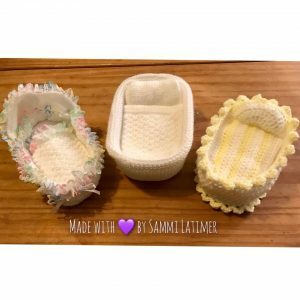 They then send the donations to hospitals, bereaved parents, and any parents, grandparents, and siblings who are grieving the loss of young loved ones. UPW offers three special services. 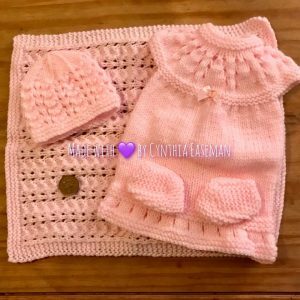 First, to hospitals, mortuaries, and funeral homes they send knitted and crocheted items. 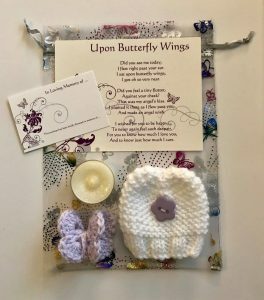 This is their Knitted Wings Project, and it includes all kinds of knitted items, including clothing, blankets, wraps, and pockets. Second, alongside the clothing, they also provide keepsake bags. These measure 17″ x 23″ and work well for small storage spaces. They’re also perfect for parents who don’t happen to receive memory boxes from their children’s hospitals. Finally, UPW works with an organization called First Touch. 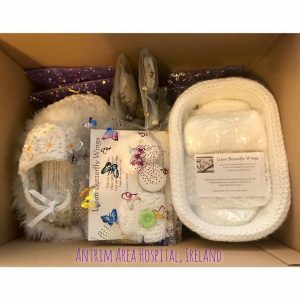 This organization provides memory boxes to the babies of St Georges Neonatal unit. 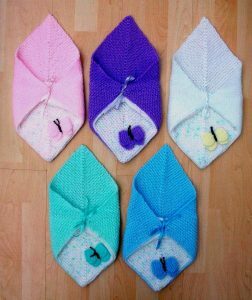 They also provide blankets and matching teddies to help fill their boxes. UPW might sound familiar to you, and indeed it should. 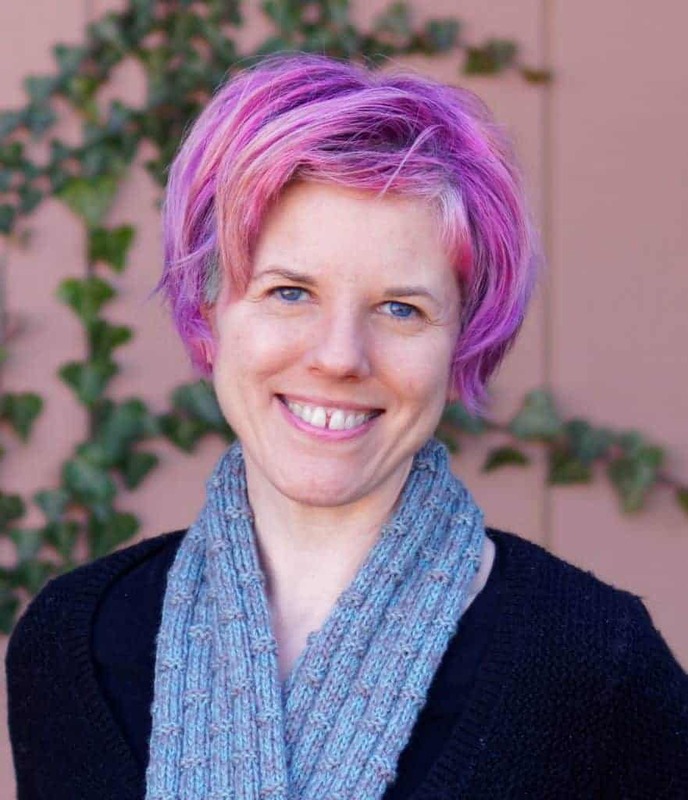 Lucy started the organization in 2011, and Knitting for Charity featured it the following year. She and UPW took a break in 2014. Last year, she returned to the scene and reopened UPW, and they have been running strong since! UPW always needs charity knitters, crocheters, and other makers! If your fingers are itching to get started, head to their Volunteers page. Here, you’ll see links to answers to frequently asked questions (and not-so-FAQs too!). These include guidelines and needs. You’ll also find links to accepted patterns and a shipping address. Another great way to help is by spreading the word. Even if you have friends who don’t knit, crochet, or sew, they can help by donating either money or the new store-bought items UPW needs. There’s also a fundraising shopping page that offers proceeds to UPW without any extra cost to the consumer. Finally, you can keep up with Upon Butterfly Wings on Facebook and on Instagram. 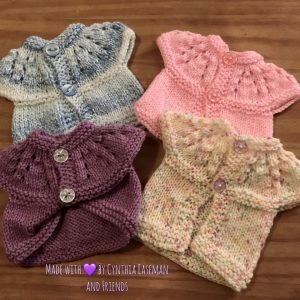 One of the best things about knitting for Upon Butterfly Wings is that the items they need are tiny, so you can quickly knit many beautiful items that you know will go to a tremendously worthwhile cause. Why not gather your softest, prettiest baby yarns and start knitting or crocheting today?